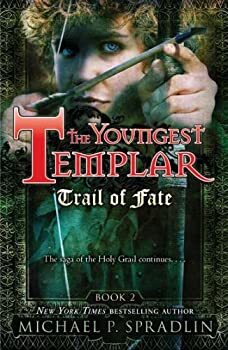 Trail of Fate, the second book in The Youngest Templar trilogy picks up right where the previous book, Keeper of the Grail, left off. Our hero and protagonist Tristan is swept overboard during a storm and washed up on the shores of southern France. In his possession is the Holy Grail, bequeathed to him by his master Sir Thomas, along with a solemn promise to deliver it safely to Rosslyn Chapel in Scotland. The task is not quite as simple as it seems, for a rogue Templar Knight called Sir Hugh is after Tristan for reasons that he can’t quite fathom, knowing only that the man covets the Grail and knows something about Tristan’s mysterious parentage. But for now, Tristan has bigger problems. Separated from his friends Robard and Maryam (sound familiar? ), Tristan is found by a group of French travelers who are more than what they seem. Instantly smitten by their leader (mainly because she’s a. pretty, and b. smells nice), Tristan swears his loyalty to Lady Celia and learns that she and her companions are Cathars, and therefore considered heretics by the church. The main conflict of the novel is Tristan and his allies protecting Lady Celia and her people as Sir Hugh’s Templars and the Church’s High Counsel lay siege to their fortress of Montsegur, with added intrigue involving Sir Hugh’s vendetta against Tristan, his mysterious background, and his commitment to protecting the Grail. Once again Michael Spradlin tells a tale that is high on action and low on logic, but which should appeal to most young readers, especially those with a taste for historical fiction with a few hints of fantasy and legend. Told in first-person narrative, the plot races along at break-neck speed, not stopping to dwell on any frivolous details. Tristan and his companions stumble into one dangerous circumstance after another, relying on Tristan to come up with various plans to extract them from their continuous life-or-death situations. Joining Tristan in his quest are Robard Hode and the Saracen Maryam, who are clearly meant to be the prototypes for Robin Hood and Maid Marian (how Spradlin will link these two up with their roles in the familiar legends remains to be seen). Robard is a familiar-enough figure: a master bowman, a rebel against authority and sympathetic to the poor; but Maryam has been reimagined as a Saracen assassin. It is an interesting variation on the iconic Maid Marian, but Tristan (and the author) is frustratingly uninterested in her. How did this young woman come to be trained as an assassin? Why is she essentially betraying her own people in order to help two Englishmen? Does she have any qualms about falling in love with a Christian? Nobody asks, and she’s not telling; as such, she remains an enigmatic presence throughout. Amidst all this action, the Grail itself is little more than an afterthought; a McGuffin that makes a low humming sound whenever Tristan is in danger and which may or may not have miraculous powers. So far, it’s not particularly interesting. The story is sprinkled with historical tidbits, such as information on the Crusades and the Cathars. In the previous book Spradlin painted an accurate portrait of King Richard as a tempestuous man who is quick to both anger and forgiveness; here we meet the equally interesting Queen Eleanor who is portrayed as a rather conniving adult-child with a “high-pitched cackle” but a cool head, who clearly knows more than she’s letting on about Tristan’s mysterious lineage. Trail of Fate is an improvement on its predecessor, with a smoother and less disjointed story, as well as higher stakes and deeper character development. Unfortunately, it ends on another irritating cliffhanger. It’s one thing to end the book mid-journey, but to have a “to be continued” tagline in the midst of a stalemate where lives hang in the balance is just cruel. REBECCA FISHER, with us since January 2008, earned a Masters degree in literature at the University of Canterbury in New Zealand. Her thesis included a comparison of how C.S. Lewis and Philip Pullman each use the idea of mankind’s Fall from Grace to structure the worldviews presented in their fantasy series. Rebecca is a firm believer that fantasy books written for children can be just as meaningful, well-written and enjoyable as those for adults, and in some cases, even more so. Rebecca lives in New Zealand. She is the winner of the 2015 Sir Julius Vogel Award for Best SFF Fan Writer.